LET THE BULLETS FLY is an utterly ridiculous, hilarious, cartoonish movie of the kind that made KUNG FU HUSTLE so superb, but without the latter film's heart. Written and directed by Wen Jiang (THE SUN ALSO RISES), it is set in 1920s provincial China, where the tax revenues of small towns are fought over by provincial governors and brutal mafiosi drug runners. The movie is a kind of action flick come comedy of errors. Chow Yun-Fat looks like he's having a ball in the roll of Master Huang - the local drug lord defending his territory against the new governor, played by Wen Jiang. That governor is an imposter, really a gangster, but the real meat of the story is whether either that gangster or indeed Master Huang is really the legendary and feared gangster Pocky Zhang. And why on earth is the governor, who came to the town to milk it of its cash, turning Robin Hood?! The movie unfolds in a series of beautifully choreographed tricks and fight scenes as each guy tries to get the better of the other, culminating in the final show-down and revelation. There are lots of laughs, plenty of ridiculousness and a superb supporting performance by Carina Lau as the governor's wife - willing to do anything to support her own position. The only fault is that it's probably too long at over two hours - there's only so much zaniness one can take in one sitting. 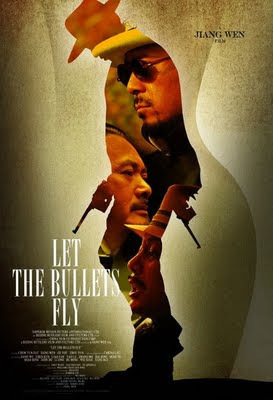 LET THE BULLETS FLY opened in China in 2010, in Hong Kong and Singapore earlier this year, and played London 2011.